Cloud-based access to North America's leading construction cost database. Plan your next budget with accurate prices and insight. Estimate in great detail or at a conceptual level. Validate unfamiliar costs or scopes of work. Maintain existing buildings with schedules and costs. 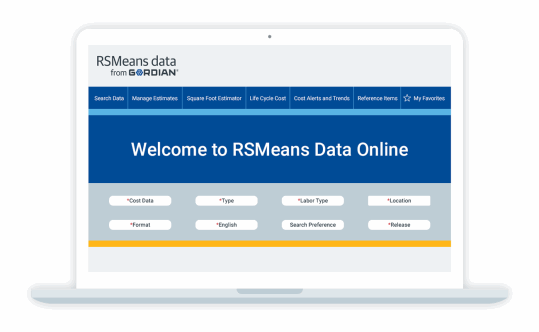 RSMeans Data Online is available in three tiers designed to meet your estimating software needs. "We kick out budget numbers for clients in minutes rather than taking hours of time to get one put together." Search by keyword or CSI MasterFormat and pin frequently used items. View detailed price breakdowns including material, labor, equipment and productivity. Access the cloud based estimating software 24/7 on desktop or your mobile device. Receive automatic quarterly updates to key materials and location factors. The basic estimate builder allows you to quickly add, edit and share your price proposals. Our estimating software enables you to access material, labor and equipment costs for each line item and adjust quantities as needed. View historical construction costs and track price trends in dynamic dashboards. Stay on top of price changes and create customizable alerts to notify you when it happens. With the square foot model estimate builder you can estimate large-scale projects in multiple locations across the country. Take your estimates a step further with predictive cost data and go 3 years into the future. "The software allowed us to verify that they could hit their ROI given the site constraints."